Precieuse lived up to her name in some style under a cool ride from Olivier Peslier to spark scenes of wild Franco-Irish celebration after running down the William Haggas-trained Sea Of Grace to win the Abu Dhabi Poule d'Essai des Pouliches. Trainer Fabrice Chappet was celebrating a first Group 1, while the winning owners, Brendan and Anne-Marie Hayes of Knocktoran Stud, have now bred three French 1,000 Guineas winners, though 28-1 Precieuse was the first to carry their pink silks. Peslier raced in a pocket of calm behind the stands' side leader Amaani, even as the race looked like it might develop towards the middle with favourite Senga and Wajnah striking for home, and Christophe Soumillon stalking the leaders on the outside aboard Sea Of Grace. 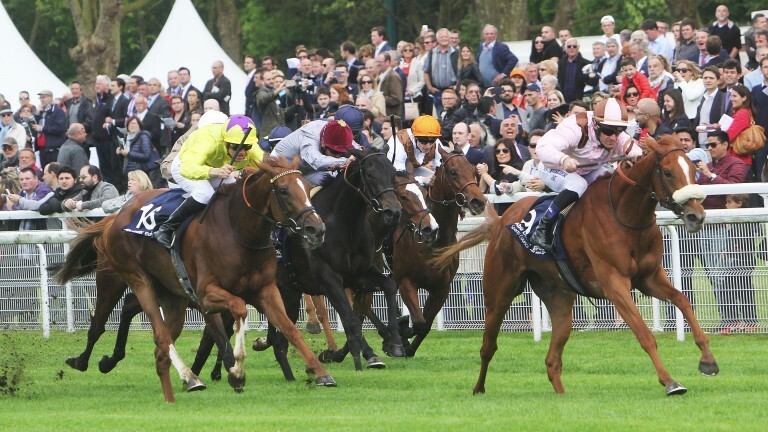 Sea Of Grace saw off the opposition closer to her but had no answer as Peslier angled out and sent Precieuse for home, winning by a length and three-quarters and still going away. "It's my first Group 1, and a first Classic," said Chappet, who has known the Hayes since his days as assistant trainer to Robert Collet. Despite that long association, Precieuse is the first horse he has trained for them. "The question mark was the trip but, as I said to the owner, she wasn't going to get beaten for speed. I was confident she'd run well and although there was a doubt about the distance she has been working like a filly that would stay. But you have to try 1,600 metres [one mile] and a straight track before you know." Precieuse is not entered in the Coronation Stakes but Chappet and his delighted owners now have the pleasant task of deciding whether to supplement the daughter of Tamayuz. "The owners were a little timid and didn’t want to enter her at Ascot so will have a think about it," said Chappet. "There is also coming back to Deauville [for the Prix Rothschild], and it's a nice question to have to ask yourself." Sea Of Grace took a major step forward having been fifth on her comeback in the Nell Gwyn and will now go to the Curragh – scene of her Group 3 success last year when trained by John Oxx – for the Irish Guineas and a possible meeting with Winter in a fortnight's time. "I thought she was going to win but she has run a brilliant race so I’m thrilled," said Haggas. "She’s eradicated that run at Newmarket and come forward, which we thought she had. "She came from quite far back but he [Soumillon] wanted to settle her, which was right. They didn't go as fast as I hoped but she stayed on well and came to give us a shout. "We’ll go to Ireland. Softer ground I think is important to her, and it was too firm at Newmarket." Heuristique rewarded the faith shown by Francis Graffard when coming from well back to be third, just ahead of Wajnah, who stayed on best of those that were ridden a little closer to the pace. "We're delighted with Heuristique's performance," said Graffard. "She was running for the third time this season and this represented a real challenge. In finishing third she's put up a great performance. She's fairly ground dependent and we might think about stepping her up in trip." In a bunched finish behind the two principals Rain Goddess fared best of Aidan O'Brien's three runners in fifth, one place better than stablemate Roly Poly. Of the two local favourites, Via Ravenna received a small bump from Precieuse when she made her run but looked held at the time and was seventh. Prix de la Grotte winner Senga looked a major player a furlong and a half out but her run came to nothing and she coasted home in 11th. However, the Niarchos family's daughter of Blame could seek compensation on better ground at Ascot. "She was travelling very well and Stephane [Pasquier] pulled her out, thinking he was going to be involved in the finish, but she seemed to lose her action on the ground," said racing manager Alan Cooper. "The thought is hopefully that she can go to the Coronation Stakes at Royal Ascot." She’s eradicated that run at Newmarket and come forward, which we thought she had. We’ll go to Ireland for the Irish 1,000 Guineas.